We were very fortunate from Sunday to today to get a dry stretch in the weather, and even a couple of days of glorious sunshine. This was especially wonderful as poor little Toby has had a bad dose of chickenpox and I was glad to be able to get us all outside without getting too cold. 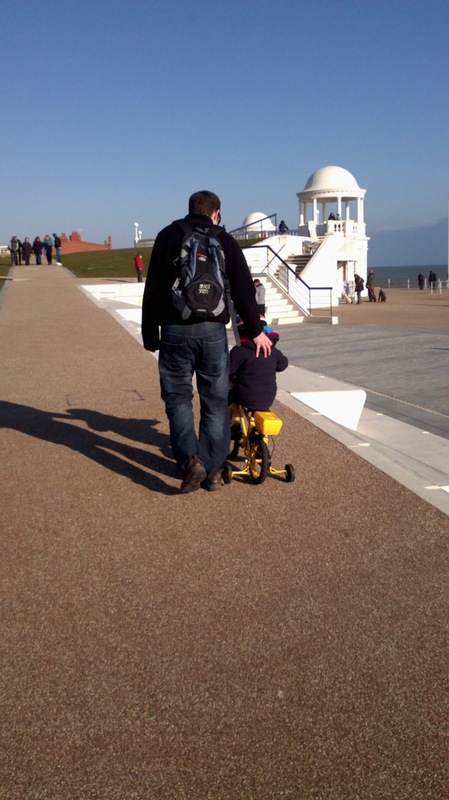 As I look at this picture and I can fantasize about the amazing, relaxed family experience we had with Ollie excitedly riding his Christmas bike in the sunshine. This wasn't quite what happened. It started with "I don't want to go out, I want to stay in and play boats" (the boat is a blanket on the living room floor where I spend many hours mending leaks and fending off crocodiles). It continued with "I'm tired, I need a nap, my little legs hurt, I'm hungry, I need a drink, I want to go home, I can't see the car, I want an ice cream, I want to go on the pebbles, I want to ride up that hill (near vertical grass slope), my tummy hurts, my welly fell off, I fell off...." ad infinitum all the way up the seafront and all the way back to the car. I write this not to moan, although it was making an otherwise lovely walk a bit miserable. I write it because when you read parenting magazines and blogs there can be a tendency to rose tint the parenting experience, and then you start to doubt your own parenting abilities when your experience differs from the one you're 'supposed' to be having. Kids have off days, just like adults, and when they're little especially there can be a seemingly unending ungrateful stream of moaning at times. Distraction and humour can help, but other times it's enough just to try to get through it without blowing a gasket. The biggest temptation to avoid is just giving up and not taking them out when they're moaning they don't want to. Nine times out of ten they will end up having a great time, and it is especially important for kids to get out in the air for as much of the day as they can. Every day where the boys spend a couple of hours outside they are better behaved, eat well and sleep well. They're getting fresh air into their lungs, light on their faces (maybe not always sunshine in the goldenest sense of the word) and lots of exercise to help burn off their boundless energy. There has also been some suggestion recently that shortsightedness is massively on the rise due to the short distances children now spend most of their lives focusing on - the not very distant walls of their home and their t.v. screen. It may just be that by providing your little one with plenty of distant vistas, you are also safguarding the functioning of their eyes.